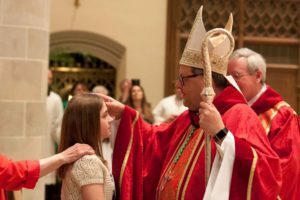 This Sacrament is conferred by anointing with Chrism on the forehead, in the laying on of hands and by words prescribed in the approved liturgical books. The Ordinary minister of Confirmation is a Bishop. A priest can also validly confer this Sacrament if he has the faculty to do so. Every baptized person who is not confirmed and only such a person is capable of receiving confirmation. Apart from the danger of death to receive confirmation lawfully, a person who has the use of reason must be suitably instructed, properly disposed and able to renew the baptismal promises. The faithful are bound to receive this Sacrament at the proper time. Parents and pastors of souls, especially Parish Priest, are to see that the faithful are properly instructed. In our parish the candidates for confirmation should complete Book No. 06 and 07 and another book which helps in the proximate preparation. The Sacrament of Confirmation is to be conferred on the faithful at about the age of discretion. In our Archdiocese of Goa and Daman, it is 16 years. As far as possible the person to be confirmed is to have a sponsor. The sponsor’s function is to take care that the person confirmed behaves as a true witness of Christ and faithfully fulfills the duties inherent in this sacrament. The names of those confirmed, the minister, the parents, the sponsors and the place and date of the confirmation are to be recorded in the confirmation register of the diocesan curia which is kept in the parochial archive. In our parish, those who are confirmed should attend the youth catechesis for atleast one year after receiving the Sacrament of Confirmation.